A question we seem to be asked on a regular basis is “So I have Amazon Echo/Google Home, why do I need a home automation solution?”. In this blog we will look at the additional benefits of using a home automation solution with a voice controlled speaker. What does a voice controlled speaker do? Turn devices on/off without needing your phone (great when cooking or holding things). When you’re out of range devices will need switching on/off manually. What does a home automation solution do? A home automation solution allows you to connect various smart home devices and be more in control. Not only can you monitor your home through security devices by using a range of sensors. You can also control devices when you’re at the office or on holiday (giving off the impression someone is at home). One of the main benefits of home automation solutions, however, is being able to set routines and schedules. This can include turning devices on/off at particular times or triggering devices such as lights on sensors such as motion. Built in security (some offerings). Control devices from different any location. Set automation such as such as shutting devices off when you leave the house. 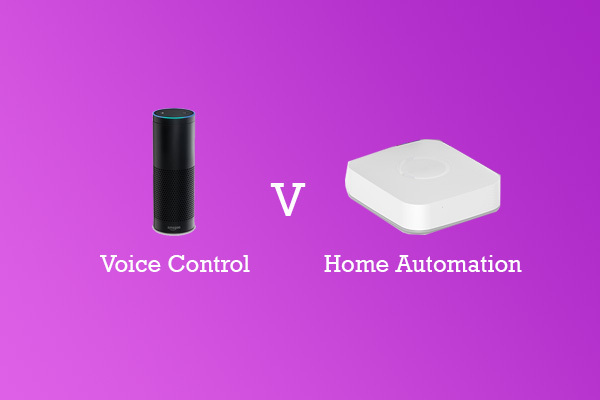 Depending on how you wish to control your smart home you have three options. It’s simple, you can control compatible devices via your voice. If the speaker goes down however, you will need to use each individual app. With this option, you can set schedules, control devices via sensors and turn devices on and off via your phone. You can have multiple devices in one place and control them via motion, presence and even by time. You can have all the benefits of the above and control devices via phone or voice. Using both solutions together can have great advantages, giving you the full smart home experience. If your devices aren’t compatible with the voice controlled speaker you may be able to connect them to your smart home solution and control them through that. Home automation devices usually have back up power and local connectivity. This means if the internet goes down you can still manage the devices without voice. Top Tip: When purchasing smart home devices make sure you check which ones are compatible with automation devices and voice controlled speakers! Thanks for reading. If you would like to have your product featured or reviewed get in touch.